New York State has one of the richest histories in the United States, a tremendous opportunity for education, economic development, and creating links to our shared past to inform the future. Founded by John Warren in 2008 and updated several times per day, The New York History Blog reports on the state’s history and promotes the history community. Here you will find new research and publications; newly available collections; news about public history advocacy and historic preservation efforts; notices about exhibits, events, conferences and grants; plus new stories from New York’s past. Writers contribute to The New York History Blog from around the state and across disciplines. Our audience are those interested in New York’s history, including lay people interested in learning more about local history; professionals keeping up with what others around the state are doing; educators and academics interested in making connections to state and local history; and those concerned with historic resources more generally, such as preservationists and genealogists. Subscribe! Follow The New York History Blog each day via E-mail, RSS, or Twitter or Facebook updates. Subscribe by email by clicking HERE. Make a Contribution! The New York History Blog needs your support to keep operating. If you find it useful, please make a contribution now at our Rally.org page. Advertise! The New York Blog provides an outstanding opportunity to promote your organization or event to a year-round audience especially interested in history. Find out more here. Promote Your News or Event! Submit your organization‘s news or event announcement here. Submit Your Story! 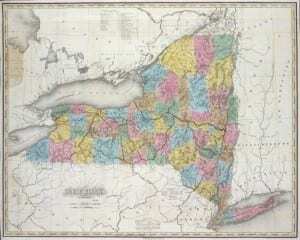 Guidelines to submit articles about any aspect of New York State history are here. Questions, comments, and concerns should be directed to the editor John Warren.